As we know java swing provides more liveliness to a web page, we can create menu bar using simple steps in java swing, which helps user to do his/her operations quickly.With out menu the task will be more tedious and very complex, so every one needs to menu bar in web page. Now lets start with a simple swing program, as by program you can get it more quickly and easily. As it is clear that JMenuBar is used for menu bar, JMenu for menu, and JMenuItem for menu item and at the last step I added all Menu items to menu and menu to menu bar. This is usesd for image displayed in the menu item. this code is used for shortcut. 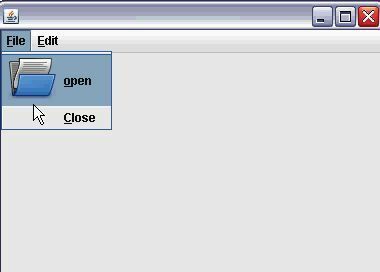 If you press alt+e edit menu will open. How to create a separator menu in java ? Lets say that import is the separator menu that you want to add.Have a look at the below code statement you will get. Create the menu first.after that.Add the menu item list that you want to add to the import. 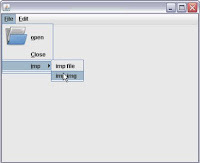 In the above code I added import file and import image menu item you can try any thing. After that add this menu items to import.See here how I did. And very thing is the same as the above sample code. Now lets look at the output screen.